At American Dental Care of Newark, our highly-trained dentists offer root canal treatment to patients in Newark, East Orange, and across the state of NJ. This endodontic procedure repairs a tooth that is decayed or infected. Recent advances in this treatment allow us to save teeth that would have been removed only years ago. The “root canal” is a natural cavity in the center of your tooth. Within this canal is soft tissue called pulp. A root canal is necessary when the pulp inside your tooth becomes infected. This infection may occur due to a deep cavity, a cracked tooth, or any other injury to the tooth. If you wait too long to seek root canal treatment, you risk infection, growing abscesses and a total loss of the tooth. Do You Need This Treatment? Swelling of the cheek, jaw, or throat. American Dental Care of Newark is a 24-hr dentist, and our staff is committed to keeping your mouth healthy and pain-free by offering the care that you need. Whether you require an urgent wisdom tooth extraction, root canal, or filling, we are here to help. What Can You Expect During Your Root Canal Treatment? Modern root canals can restore your health and comfort in just one or two appointments. 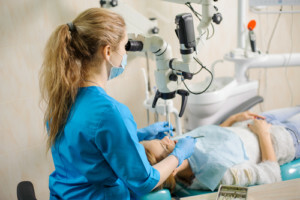 Before the treatment, the dentist will take X-rays of your teeth, numb the area for a pain-free procedure, and put a thin sheet of rubber latex over your tooth. This sheet will keep the tooth clean and dry while protecting it from the bacteria, viruses, and fungus that are found in the mouth. Make an opening in the top of your tooth. Clean out damaged and diseased pulp. Apply an antimicrobial solution to avoid further infection. Fill the chamber with a rubber-like material. Put in a temporary filling. A few weeks later, you will return to the dentist to receive a permanent crown that will restore the top of your tooth. Will I Need to Replace My Root Canal Filling? Your treated tooth can remain healthy for a lifetime! Patients ensure the longevity of their root canal fillings by brushing twice a day, cleaning between their teeth daily, and seeing their dentist regularly. The crown, on the other hand, may have to be replaced after approximately 10 to 15 years. The best way to avoid a root canal is practicing good oral hygiene and visiting the dentist for your twice-a-year check-up and teeth cleaning. Regular visits allow your dentist to treat cavities and other dental issues before they lead to an infection. At American Dental Care of Newark, located near East Orange and Newark, NJ, “We cater to cowards!” All of our procedures are as pain-free and comfortable as possible, and our staff treats you with kindness. To schedule an appointment with our dentists, call us at 973-453-9088.